For small businesses, social media is not so much important as vital: a free-to-use, easy-to-access tool that can increase your reach, pull in more customers and even resuscitate flagging sales. Yet for all its life-giving properties, social media remains something of a dark art. Analytics can be decoded in legion different ways, depending on what you’re trying to assess. Social media campaigns can fail on soar on wording, timing or myriad other unforeseeable factors. For small businesses that don’t have the budget to employ expert support, social media – in all its time-sapping, algorithm-shifting glory – can be be abandoned before it’s begun. This is where coworking comes in. Its already more than earned its excellent reputation for service to IRL networking but it also provides fertile ground for social media growth. Contrary though it sounds, small businesses are having to adapt faster than ever to succeed and surrounding yours with a host of like-minded entrepreneurs is key to your online presence – here come the practical tips. The easiest way to start is to offer fellow coworkers’ companies likes, re-Tweets and re-posts in return for them doing the same. Not only will your brand look more popular, their endorsement may lead their followers to check out what you’re doing too. It doesn’t matter that your businesses don’t do the same thing –coworkers often find they have more in common than they think. For one, both your company’s co-work – a blog post on the subject, with input from a co-member company, gives your customer base transparency and insight into your working process. Location may also prove valuable. Does another business have online links to local companies that could benefit your work? Do you? Offer an informal twitter introduction and you may be surprised by what comes to your business in return. Content, it seems, is still king: having up-to-date content on your website highlights that your business is current and engaged and can mark you out as an authority voice within your industry. Yet with time always at a premium, shareable content can get knocked down to the bottom of the company to-do list. If this is the case, ask a fellow coworking company if they might be willing to write a guest blog on your site. Again, you needn’t choose a company that does what you do – consider what additional skill set your customers might be interested to learn, or search out another small business that offers complimentary services to what you already provide. Not only do companies in shared offices have a better understanding of what each other does, friendly social relationships mean that people will often write for free in order to gain access to your customers. Writing a post in return is usually payment enough. Teaming up with a larger business can be a revelation for a small company looking to expand its reach, both on a B2B and B2C basis. Coworking means that potential collaborations are on tap. For service-providers, an online giveway of a product is one of the best ways to generate buzz. A graphic designer, for instance, may team up with a publisher and giveaway a beautifully designed book. And for companies that produce and sell products, B2B options – teaming up with courier or IT services, for example – can be invaluable in terms of saving both time and money. 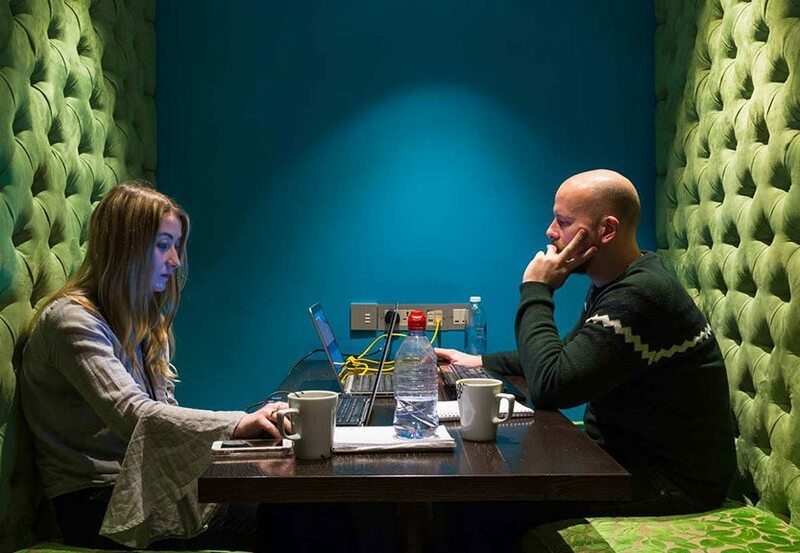 Coworking is rapidly shaking off its label as an alternative option for cash-strapped start-ups; similarly, businesses of all sizes are constantly on the look out for ways to increase brand awareness. A digital campaign that utilises the assets of two businesses will always prove more fruitful than going it alone. Wouldn’t it be helpful if your new partner was a just over the wall.